Unmanned aerial vehicles (UAV), aka drones, have seen robust market adoption fueled primarily by consumer/hobbyist and commercial demand for photography, videography, and media and entertainment. According to the Federation Administration Authority (FAA), drone shipments in the United States are forecast to increase from 2.5 million in 2016, to 7.0 million in 2020. This forecast predicts that the consumer/hobbyist market will remain larger than the commercial market for drones, and that annual commercial sales will remain relatively static between 2017 and 2020. Companies like Amazon have pulled drones into the limelight with innovative concepts for autonomous drone deliveries. Figure 1 illustrates a conceptual framework that Amazon has proposed for drone operations. 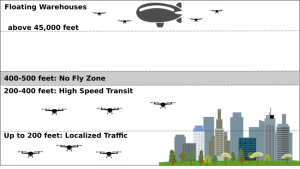 In it, Amazon proposes that the airspace up to 200 feet be used for localized traffic, and between 200-400 feet be used for high-speed transit drones. In addition, Amazon has patented a concept for floating airship-based warehouses operating above commercial airspace at altitudes in excess of 45,000 feet and supported by autonomous drones. Drones are severely limited in terms of where they can fly. In most cases, drone operators are required to maintain visual line of sight at all times of their aircraft, have altitude restrictions and are generally not permitted to fly in restricted airspace. In all but a handful of countries, drones cannot be flown over the private property of non-participating parties or over non-participating persons. Most drones can only fly for 20-30 minutes before requiring a battery recharge, which limits the range of practical applications. Improvements in battery technologies and platform energy efficiencies are needed to extend the flying time for drones. Drone manufacturers including DJI, AeroVironment, 3D Robotics and PrecisionHawk have made tremendous progress with sensor technology and on-board intelligence for collision avoidance and drone stability, etc. However, fully autonomous operations are needed for many of the use cases being proposed by companies like Amazon. This requires further developments to improve the fidelity of sensor processing and location detection, and advancements in computer vision and machine-intelligence technologies. Unlicensed spectrum technologies are normally used to wirelessly connect drones to their remote control units. While these technologies are adequate for basic drone operations within visual line of sight of its operator, they lack the coverage to effectively support beyond VLOS (BVLOS) operations. Furthermore, the bandwidth is generally inadequate for first-person view technologies that have been proposed in support of BVLOS operations. Many drone designs lack adequate security safeguards. Security researchers have demonstrated a variety of potential attack vectors, including flooding attacks, drone hijacking and impersonation attacks. Industry players like Amazon, AT&T, BSNL, CNN, NASA, Nokia, PrecisionHawk and Qualcomm as well as regulators such as the FAA have been conducting technology trials with the aim of addressing regulatory constraints and advancing drone technology capabilities. These efforts are loosely related to the UAS Traffic Management (UTM) initiative that is being spearheaded by NASA. The players involved in UTM recognize that effective drone identification and command-and-control capabilities are needed to safely address regulatory constraints. Many UTM proposals and technology trials have used LTE mobile cellular technology for drone command and control so that drones can operate safely BVLOS and over crowds at events and in urban environments. Other technologies such as ADS-B have also been used as a complement to LTE for UTM applications. ADS-B is widely used as an alternative to radar for air traffic control, and has been implemented in drones by DJI and PrecisionHawk using uAvionix technology. While ADS-B enables basic drone proximity information, it lacks the versatility offered by LTE, which is needed for many proposed drone use cases. LTE technology trials for drones have been conducted by a variety of companies including Nokia and Qualcomm. Qualcomm has demonstrated that while LTE networks are capable of supporting drones up to altitudes of 400 feet, dedicated optimization efforts are likely required to address changes in handover boundaries and the potential for increased interference relative to terrestrial operations. This will create an operational headache for mobile operators, whose networks have been optimized for terrestrial as opposed to airborne operations. Some operators, including AT&T in the U.S., are aggressively pursuing market opportunities for LTE-enabled drones. Nevertheless, we believe that, because of optimization challenges and the likely network traffic demands, practical use cases for LTE-enabled drones should initially be targeted towards isolated implementations where network performance is not unduly taxed (e.g., outside of urban centers). These isolated implementations will evolve towards larger-scale deployments over the next five years as technologies mature and regulations evolve. In addition, we expect that drone solutions will capitalize on advancements in autonomous vehicle technologies, and the ultra-low latency and ultra-broadband capabilities that are intended with 5G.